This chapter presents a general historiographical framework for interpreting the renaissance of general relativity as a consequence of the interplay between internal and environmental factors. The internal factors refer to the resilient theoretical framework provided by general relativity to physicists working in diverse and dispersed fields. The external factors relate to the changing working conditions of physicists in the post-World War II period, with the newly created conditions for the mobility of young researchers, for the transfer of knowledge in a growing international community, and for the self-organization of an identifiable community. These external factors created a favorable environment for integrating the dispersed research endeavors under the new heading of “General Relativity and Gravitation” research. 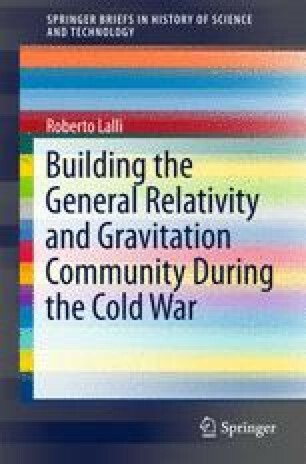 This, in turn, provided the conditions for the emergence of a coherent investigation of the theoretical core of general relativity for its own sake and for the creation of a community specifically dedicated to this goal. This chapter is based on the historiographical framework developed in Blum et al. (2015). Blum, Alexander, Roberto Lalli, and Jürgen Renn. 2016. The renaissance of general relativity: How and why it happened. Annalen der Physik 528: 344–349. doi: 10.1002/andp.201600105. Blum, Alexander, Domenico Giulini, Roberto Lalli, and Jürgen Renn. 2017. Editorial introduction to the special issue “The Renaissance of Einstein’s Theory of Gravitation”. The European Physical Journal H 42: 95–105. doi: 10.1140/epjh/e2017-80023-3. Goenner, Hubert. 2004. On the history of unified field theories, Living Reviews in Relativity 7: 2. doi: 10.12942/lrr-2004-2. Kragh, Helge, and Dominique Lambert. 2007. The Context of discovery: Lemaître and the origin of the primeval-atom universe. Annals of Science 64: 445–470. doi: 10.1080/00033790701317692. Kruskal, Martin D. 1960. Maximal extension of Schwarzschild metric. Physical Review 119: 1743–1745. doi: 10.1103/PhysRev.119.1743. Petrov, Alekei Z. 2000. The classification of spaces defining gravitational fields. General Relativity and Gravitation 32: 1665–1685. doi: 10.1023/A:1001910908054.